Every year, the month of November is notable for two events. The beginning of the month is marked by people muttering to themselves "Oh my God, it's November already?" and the end, in the U.S. at least, is celebrated by surrounding ourselves with cousins whose kids' names we can't remember and eating food until we explode. This particular November is also notable for a milestone in PC gaming: the 10th anniversary of the release of Half-Life 2. This will no doubt inspire many nostalgic replays of Valve's landmark FPS, and Mod of the Week is here to make a suggestion about how best to walk another mile in Gordon Freeman's boots. There's no shortage of full-conversion mods for HL2, and many of them are great and well worth your time, but today we're looking at mods that keep the original story intact as opposed to providing an entirely new experience. Enhancement mods, in other words. What's actually out there to improve the game? Our first stop was to pay a visit to the simply named "Update" mod. 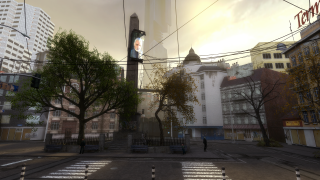 Half-Life 2: Episodes One and Two provided a bit of a graphical upgrade over the original game, mostly in the form of better textures and slicker effects, but Valve never bothered to retrofit HL2 with these improvements. Modder Filip Victor took it on himself, but unfortunately, when HL2 was moved over to SteamPipe, it wound up breaking the mod. A fix, while promised in 2014, has yet to materialize. There were also rumblings about an ENB for HL2 that was sadly never released by the modder who did the same for the original Half-Life. No luck there. I also installed this ENB that purports to add depth-of-field and SSAO, but despite following the instructions I wasn't able to activate it in-game. Hurm. I'm zero for three. That leaves us with pretty much a single option for souping up HL2 graphically: FakeFactory's Cinematic Mod. The name probably sounds familiar: it's been around for a while and there were a lot of complaints that it went too far: not just adding higher resolution textures, advanced HDR, new props, and dynamic shadows, but replacing the game's character models with new, completely different looking HD versions and adding music from the new Batman films. While I agree that most of the new character models are tremendously off-putting and the music is a baffling choice, it's important to point out that Cinematic Mod is almost ridiculously customizable. You can run the mod without the replacement character models, leave out the new music, and tailor the look and even the difficulty of the mod to a high degree. In fact, I'd recommend turning off a few things. The enhanced bloom is a bit much, and the head-bob made me nauseous (and I can't ever recall getting motion-sick from an FPS before). I enjoyed playing with the new weapons: a laser-dot pistol and some meatier machine-guns are fun, and iron sights and weapon recoil adds a bit more of a shooty feeling to the shooting (again, you can choose to play with the standard weapons as well). As far as the new models go, I actually liked the new Combine metrocops and soldiers the mod adds: they're bulkier and more dangerous looking without being a major departure from the originals. As for the overall look of the mod, I liked a lot of it. It's slicker and shinier, and many of the new textures are fantastic. It does still go a bit far: I don't really need video screens flashing the word OBEY to get the idea that I'm in a dystopia, and some of the new graffiti textures are hardly subtle. Still, for the most part, it's very impressively done. If you decide to use it, be prepared for a hefty 10 gig file, and torrent it or else you'll have to download it as sixteen separate .rar files (ugh). You can find it here, and here's a video detailing installation and configuration. What else can you do to spice up your visit to City 17? Well, if you don't mind going full-on wacky, you can always try two previous Mod of the Week picks. There's Crylife (actually a submod for the high-octane SMOD), which gives Gordon Freeman the nanosuit from the Crysis games, and there's also gmDoom (actually an addon for Garry's Mod) that lets you play HL2 with weapons and monsters from Doom. You'll still be able to enjoy the story beats of the original game while spawning cyberdemons or running around with your cloak engaged. Ultimately, though -- and I realize this is an odd conclusion for a mod column to reach -- I'd recommend replaying Half-Life 2 without any mods whatsoever. Yes, it's been ten years, and sure, the game is definitely beginning to show its age. But this mod enthusiast is happy to admit that some games just don't need improvement.